LUCY MUNGOMA, Permanent Secretary in the Ministry of Foreign Affairs of Zambia, underscored the need for the international community to resolve conflicts on the African continent, including the situation in Libya, within the framework of the African Union. Zambia shared the relief of the Libyan people in the need to rid themselves of a leader who committed egregious atrocities against his own people. However, she expressed concern over new atrocities being committed against black people in that country, both citizens and migrants from other African nations. A strong message must be sent that, not only would the perpetrators of such atrocities be pursued as vigorously as Muammar al-Qadhafi had been, but that all allegations would be thoroughly investigated. It would be tragic if, in celebrating the ousting of Qadhafi, the United Nations turned a blind eye to those atrocities still being committed. She said that the drought situation in the Horn of Africa presented a humanitarian emergency that threatened the lives of 21 million people. While erratic rainfall in past years was the main cause of the drought, the prevalent political instability and violence in Somalia had hampered that county’s ability to effectively respond to the crisis. She called on the United Nations to implement the recommendations of the Special Representative of the Secretary-General to Somalia, in which he called for the establishment of a United Nations peacekeeping mission there. Last week, on 20 September, Zambia had held general elections and, on 23 September, had welcomed its fifth and newest President, he noted. Zambia’s continued political stability had a positive impact on the economic development of the country, with real GDP growth averaging 5.4 per cent in the past decade. However, her country still faced the challenge of translating economic growth into significant poverty reduction. The target date for the Millennium Development Goals was four years away, and while Zambia had made notable progress towards some goals, such achievements risked being reversed, owing to the multifaceted negative impacts of the world economic recession, unfulfilled commitments, and ever diminishing levels of financial assistance. Turning to other issues of concern to Zambia, he said the country was battling both non-communicable diseases and infectious diseases alike, fighting desertification and land degradation, and climate change. Zambia was looking forward to the forthcoming talks on climate change to be held in Durban. With the year 2012, Zambia was also anticipating the successful conclusion of the arms trade treaty, as a strong and robust instrument would help foster regional and international peace and security. Africa was now the largest of the United Nations regions, with 54 Member States, the same as Asia. 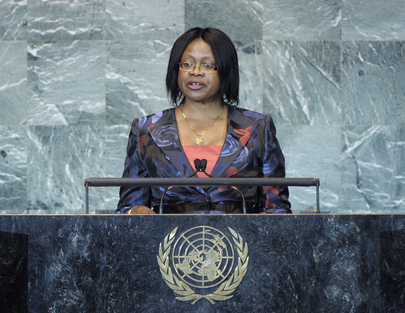 It was also a fact that three quarters of the agenda on the Security Council were African issues. Unfortunately, it was also the only continent with no representation in the permanent category of the Security Council, and it was underrepresented in the non-permanent members’ category. Africa’s request for two permanent seats – with all the rights and obligations of current members – and two additional non-permanent seats was a matter of justice and respect for its right to have an equal say in decision-making on issues of concern to the continent. Indeed, it was about democracy, as well as the dignity of a people and a continent.